The Monterey International Pop Music Festival was a three-day concert event held June 16 to June 18, 1967 at the Monterey County Fairgrounds in Monterey, California. Crowd estimates for the festival have ranged from 25,000-90,000 people, who congregated in and around the festival grounds.The fairgrounds’ enclosed performance arena, where the music took place, had an approved festival capacity of 7,000, but it was estimated that 8,500 jammed into it for Saturday night’s show. Festival-goers who wanted to see the musical performances were required to have either an 'all-festival' ticket or a separate ticket for each of the five scheduled concert events they wanted to attend in the arena: Friday night, Saturday afternoon and night, and Sunday afternoon and night. Ticket prices varied by seating area, and ranged from $3 to $6.50 ($21–46, adjusted for inflation). 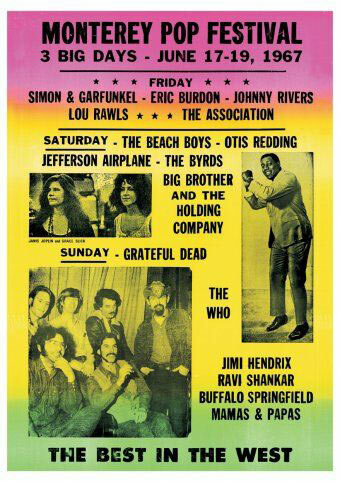 The festival is remembered for the first major American appearances by The Jimi Hendrix Experience, The Who and Ravi Shankar, the first large-scale public performance of Janis Joplin and the introduction of Otis Redding. The Monterey Pop Festival embodied the theme of California as a focal point for the counterculture and is generally regarded as one of the beginnings of the "Summer of Love" in 1967; the first rock festival had been held just one week earlier at Mount Tamalpais in Marin County, the KFRC Fantasy Fair and Magic Mountain Music Festival. Because Monterey was widely promoted and heavily attended, featured historic performances, and was the subject of a popular theatrical documentary film, it became an inspiration and a template for future music festivals, including the Woodstock Festival two years later.